Nuclear Fusion Closer to Becoming a Practical Reality? Using nuclear fusion – star energy – to power the world’s dishwashers, TVs and servers has long been a twinkling in the misty eyes of physicists, but it inched closer to reality this week as the American National Ignition Facility (strap line: “Bringing Star Power To Earth”) struck a deal with the UK company AWE and Oxford-based Rutherford Appleton Laboratory. The National Ignition facility (NIF) in California – at Lawrence Livermore National Laboratory – has been using lasers to force together the isotopes and create the fusion needed for the process to work. Scientists there believe they are within years of achieving the goal in the lab and project that the concept could eventually become a commercially viable energy source. Adult Swim is running a first look of Brad Neely‘s China, IL featuring both Baby Cakes and the Professor Brothers. It’s strange to see the characters with pupils. It’s scheduled to debut at midnight, Sunday October 2, but I’m not sure if that means Saturday night/Sunday morning or Sunday night/Monday morning. London based graphic designer Gex sells these stark posters representing different philosophies. You can see them all here and purchase them here. You can read the text better in the online shop. 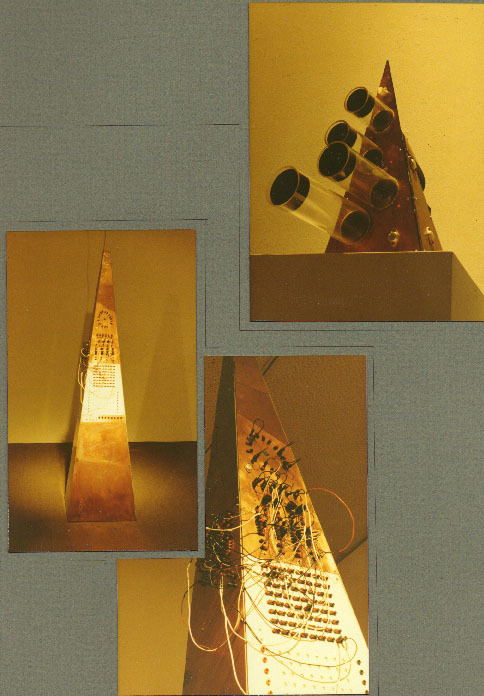 In the 1960s, Stanley Lunetta created a number of interactive scultures using electronic audio generators. Some of them were still running as of 2008. Some responded to elements such as heat and light to change the sounds, others had more explicit human interactive elements. You can find more information at Lunetta’s site, including the Moosack Machines section. Summary: Disclosure of conflicts of interest isn’t enough, in fact in may make matter worse. But conflicts of interest may also be inevitable. Integrity is what matters, but that’s hard to measure. Disclosure: I work for SiliconAngle, a TechCrunch competitor. I love transparency. I think it’s an important for governments, and institutions like the press, to be as transparent as reasonably possible. I also agree with Jay Rosen that if the “view from nowhere” – the faux-objectivity of the mainstream press – were replaced by “this is where I’m coming from” we’d all be better off. Everyone has biases, and it’s better to get those out of the way than to pretend they don’t exist. But transparency isn’t a cure-all. In the debate over Michael Arrington’s “Crunch” branded venture capital fund, many suggest that Arrington if discloses to his potential conflicts of interest, and therefore his biases, that will be good enough. In fact, that might be better than pretending to be objective. But is this the case? The problem with the debt ceiling debate was not one of “partisan bickering.” It was one of Republican obstructionism. Framing it as partisan bickering, which establishment media has a tendency to do, was negligent reporting. Every single issue ends up being described this way. The party has built a whole catechism on the protection and further enrichment of America’s plutocracy. Their caterwauling about deficit and debt is so much eyewash to con the public. Whatever else President Obama has accomplished (and many of his purported accomplishments are highly suspect), his $4-trillion deficit reduction package did perform the useful service of smoking out Republican hypocrisy. The GOP refused, because it could not abide so much as a one-tenth of one percent increase on the tax rates of the Walton family or the Koch brothers, much less a repeal of the carried interest rule that permits billionaire hedge fund managers to pay income tax at a lower effective rate than cops or nurses. Republicans finally settled on a deal that had far less deficit reduction – and even less spending reduction! – than Obama’s offer, because of their iron resolution to protect at all costs our society’s overclass. This was also demonstrated by the party’s eagerness to engage in deficit spending when the spending was going to enrich defense contractors in the form of war spending during the Bush administration. My biggest point of disagreement with Lofgren is probably his take on the Democrats. I don’t think Democrats are merely spineless any more. They serve the same corporate donors that the GOP does. It’s not in their best interest to actually pass the measures they propose. You can see the same sort of behavior, occasionally, from the GOP – the bailout for example. I should also note that I don’t think this is a “real” conspiracy. I very much doubt the Democrats are having meetings deciding to throw fights or even elections. I don’t think there are lobbyists calling up Obama telling him what to do. They don’t need to tell him, and congress doesn’t need to be told how to play the game. as I remember it, the setting for the first movie in the Mad Max series is a world where oil scarcity has led to economic disaster and the beginning of the breakdown of social order; where, whilst the police and justice systems continue to function, governmental cutbacks have diminished their ability to effectively maintain control; and where, whilst small pockets of civil society remain relatively unchanged (Max lives in a comfortable suburb with his wife and child), increasingly large areas are plagued by criminal gangs of looters. In fact, the three-movie arc of the Mad Max films is in many ways a beautifully realised totally ridiculous, but excellently costumed, account of the slow breakdown of order (I), followed by total chaos (Road Warrior), followed by the first stages of re-establishing technology, trade and culture (Thunderdrome).